Welcome back to another edition of the Team Santa Inc. Weekly e-News hot off the presses. ‎Next Thursday is Valentine’s Day. Remember the flowers guys. However, after that, we have smooth sailing all the way to SPRING. Only a mere five weeks after Cupid’s Valentine Celebration, we’ll will begin to warm up and rid our weather system of all this cold weather. Team Santa Inc. is based in New Jersey, so ‎although we do get our share of cold weather, it’s the tropics compared to the northern US states, from Maine to Washington. “Baby it’s cold outside”, and that’s a reality. Southern US states are cold as well. Not as cold as the north. Team Santa Inc. is getting ready for springtime decorating with wonderfully new LED lighted indoor/outdoor decorations. From Saint Patrick’s Day on March 17th, until Easter Sunday on April 21st, these are two excellent reasons to enjoy the holiday with these exciting new LED lighted decorations. Before you know it, you’ll be drinking green beer and eating a corn beef sandwich. So chin up, the “the future is so bright that you have to wear shades”. Join ChristmasDecorationsETC.com and use coupon code shamrock during the checkout process this week only to save 20% off these darling and whimsical lighted Saint Patrick’s Day and/or Easter decorations. This 20% coupon code will expire automatically on Thursday February 15, 2019. Go ahead and order your springtime LED lighted holiday decorations in time to take advantage of the twenty percent discount coupon code. Spend $75 and get free shipping anywhere inside the continental U.S.A. Important Information – Please make sure to add comm@christmastopia.com to your list of contacts to make certain that you are getting our WEEKLY E-NEWS delivered to by email once a week right. Click here to add or update an email address of anyone who may want to receive weekly email updates about decorating for the seasons, all year round. Most orders ship in 24 hours or less. Offers only good while supplies last. Until next week…. Do you own or work in a retail store? Any store, not necessarily ‎a flower shop. Did you know that a recent survey in Canada concluded that when the staff was excited about the store’s overall display, that store grossed higher sales from foot traffic. Many of the successful stores have incorporated LED string lighting into their product displays as a visual attention getter. LED is absolutely fascinating and the colorful illuminated signs are a big hit. The lighting encourages people (foot traffic), to come into your store. Once they are inside, they naturally look upwards. It’s just instinctive. When you install decorative lighting start at six feet or above. You are directing that person, who is a potential customer, right to where he wants to go. Then go ahead and make that sale. Please make sure you get the Team Santa Inc. Weekly delivered to your inbox once a week. We plan to bring you a plethora of very cool products and accessories for decorating the seasons of 2019. Stay ahead of your competitors by getting tips from Team Santa Inc. Please read the important information below. Make sure you are getting the TEAM SANTA INC. WEEKLY E-NEWS delivered by email once a week right to your inbox. To make sure that you are properly set up, add comm@christmastopia.com to your address book to prevent Team Santa Inc. email messages from ending up in your spam folder. Click here to add an email address to receive weekly updates related to decorating all year round. Welcome ‎to the Team Santa Inc. News Daily Final Post of 2018. We hope that you had a good year. If not, then next year will likely be better. So what’s all the clammer about? 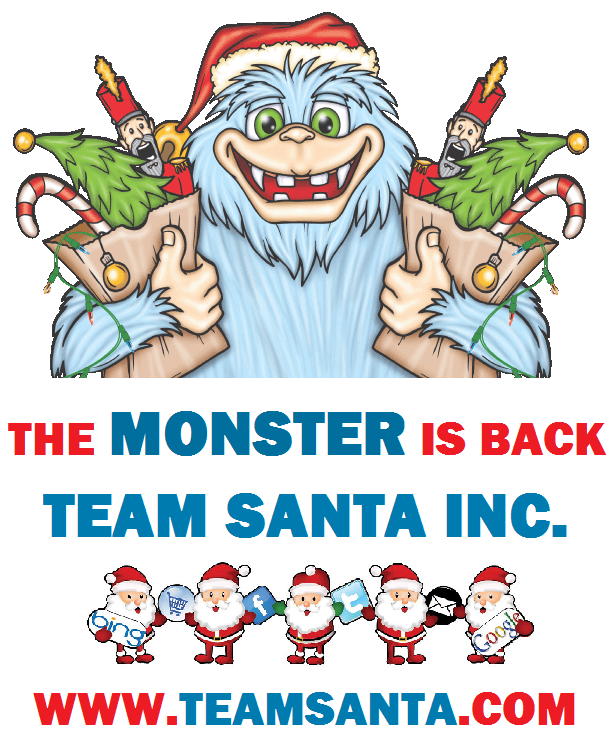 The MONSTER is back and he is hosting our BIG AFTER CHRISTMAS SALE on all three Team Santa Inc. websites. ‎ Deals that are absolutely INSANE. No kidding around, just wait until you see what he has in store for you. Our annual Monster After Christmas Sale Event is underway. You might as well forget the coupon (frosty) and go directly to HAGGLE. If you see a product that interests you, simply send a haggle request by email to ‎support@teamsanta.com‎. Kindly remember to include the word “haggle” (no quotes) on the subject line. In the body of the message, please include the item number, the product’s name and the dollar amount that you are willing to pay for it. Please take into consideration the cost for shipping. The Team Santa Inc. MONSTER will run the numbers and come back to you and either accept your offer, counter it, or inform you that the product is sold out for the remainder of the 2018 season. This is where we get serious. This post is actually, silent, advanced notice of something very BIG to come. So big, that you will want to bookmark your favorite Team Santa Inc. website(s), so that you will be ready to go and get the absolute lowest possible prices anywhere! The Team Santa Inc. BIG SALE EVENT is going on this weekend, so come on over and check it out.‎ We are so excited to see you! Until we meet again, happy new year and…. SINGLE MONSTER W TEAM SANTA INC. Your place must be totally decked out. The beautiful Christmas tree, holiday lights, lighted outdoor decorations. It looks great right? Yeah, except for the wreath. Where’s the wreath? Did you hang a wreath? If you don’t have a wreath, then DEAL #2 for you. Don’t miss this outstanding opportunity for you to get an awesome looking wreath with high tech LED mini lights pre-installed. Your neighbors will wonder where you got such a cool looking Christmas wreath. All sizes and colors of wreaths are all on sale now @ 25% OFF regular price. Do you know why we hang wreaths during the holiday season? In Christianity, the Christmas wreath has been used since early in the 19th century to symbolize Christians belief in Christ and was initially created from fresh evergreens. The word ‘wreath’ is derived from an English word meaning to twist, such as in a circle. Some believe that initially wreaths were hung on doors in Ancient Rome to represent victory in battle. Important Add Comm@Christmastopia.com to your address book and it will prevent Team Santa Inc. email messages from ending up in your spam folder by mistake. Just click here to sign up to receive these amazing offers by email. Most deliveries take place 4-7 business days after the order is placed. Offers only good while supplies last. Welcome to the Annual Team Santa Inc. Outdoor Lighted Holiday Display Contest. We are so excited about seeing your lighted holiday decorations and incredible lighting displays. It’s never been easier to take a photo these days. Just submit photos(s) of your holiday display and show us who has the BESTand BRIGHTEST lighted holiday display in America‎. Please send your photos attached to an email message and send it to media@teamsanta.com.You can send up to 4 photos for each email entry. Please include your first name and state where you reside in the message part of the email. Members from Team Santa Inc. will review the submitted photos and select, in their opinion, the top five lighted holiday displays of 2018. If you think your holiday display has what it takes to win, then send us photos of your holiday display to enter the contest.‎ The last date to submit your photo(s) is December 23, 2018. AFTER CHRISTMAS SALE GOING ON NOW! Our post season sale is going on this very minute. Save 15% OFF everything on our three websites. The coupon code is “frosty“ (no quotes). Enter the coupon code during the checkout process and then press the “apply” button. The screen will refresh and you will see that 15 percent has been deducted from your order total. Our deepest discount of 2018 is happening now. Spend $75 and getFREE ground shipping inside the continental USA. Add Comm@Christmastopia.com to your address book to prevent Team Santa Inc. email messages from ending up in your spam folder. Just click hereto sign up to receive these offers by email. Remember, you have until December 23, 2018 to submit your photo entry. Offer valid for US residents. No other rules or restrictions apply. We just can’t wait to see your photos. Deliveries take place 4-7 business days after the order is placed. Offers only good while supplies last. AFTER CHRISTMAS SALE GOING ON NOW! Save 15% OFF everything on our three websites. The coupon code is “frosty“ (no quotes). Enter the coupon code during the checkout process and then press the “apply” button. The screen will refresh and you will see that 15 percent has been deducted from your order total. Our deepest discount of 2018 is happening now. Spend $75 and get FREE ground shipping inside the continental USA. Add comm@Christmastopia.com to your address book to prevent Team Santa Inc. email messages from ending up in your spam folder. Just click here to sign up to receive these offers by email. To place your order send an email to support@teamsanta.com and in the subject just enter the part number701POEC and the name of the product. In this case, the brilliant LED Lighted Peace on Earth Sign. It’s not necessary to add anything else to the email, unless you have special instructions for us. Then go ahead and send the email message to Team Santa Inc. We will respond by sending you secure Paypal invoice to your email address for the product(s) that you want to order. Follow the instructions that are included in the email that you receive that links to the invoice and you will be able to make a SECURE online payment. Once payment process has been completed, your order, including your shipping information, will be sent electronically to the packing and shipping department, who will ultimately ship out your order. We ask that you please allow 7-8 business days for delivery. Exclusive: The 15 percent off coupon is holly and HAS BEEN EXTENDED to Wednesday 11/28/18 11:59 pm. Remember, orders that are $75 get FREE shippinginside the continental USA. Important: You can’t get this or any other new exclusive incentive, unless you receive promotional email from Team Santa Inc.
Should you have any questions before or after you place an order, please send those inquiries to support@teamsanta.com. A Team Santa Inc. representative will contact you shortly thereafter. Enjoy the lowest prices on Outdoor LED lighted holiday decorations, prelit or unlit Christmas trees, LED Christmas lights, shatterproof plastic Christmas ornaments plus tons of other stuff, all on sale priced low to sell. HUGE SPECIAL OFFER, we have a coupon code made EXCLUSIVELY for you, just for being a member of the Team Santa Inc. Decoration Nation. This exclusive coupon code will save you 15 percent off instead of the 10 percent off that you get on the Team Santa Inc. websites. The exclusive coupon code at checkout is called holly. The coupon will expire Monday, November 26, 2018 at 11:59pm. Important: You can’t get this or any other new special incentive, unless you receive promotional email from Team Santa Inc.
Offers good while supplies last. Please allow 5-7 business days for delivery.